Is Drudge supporting Beto over Cruz? Over the weekend Drudge had as his big headline an article in support of Beto O’Rourke and his aspirations to not only beat Ted Cruz but perhaps even take his bed national to the presidency, should he lose to Cruz. 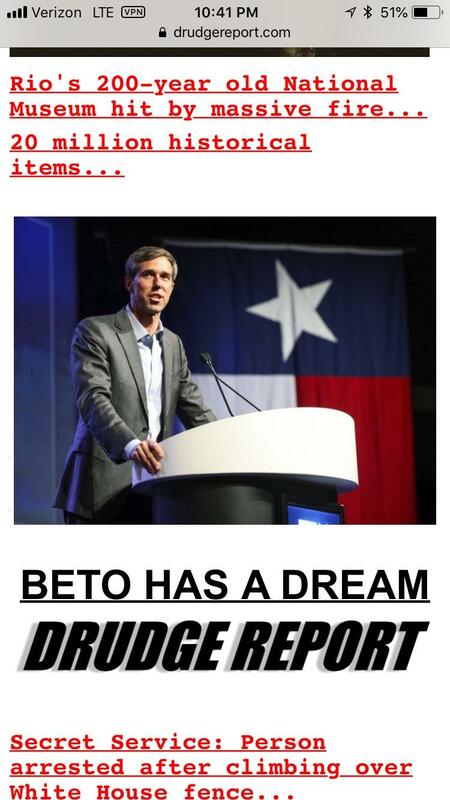 Some took this as a sign that Drudge is now supporting Beto over Cruz. After all, it was his headline for a good portion of the day yesterday and into this morning. How could it not be support. As we’ve pointed out in the past, Drudge is no fan of Ted Cruz. He attacked Cruz and his Christianity back in the 2016 primaries when he was running against Trump. But the 2016 primaries are one thing and could, perhaps, be excused. Supporting a hard-liberal candidate like O’Rourke in the general elections against Cruz would be absurd, even for a RINO. So what does that make Matt Drudge?